A structured period of transition guided by a preceptor – an experienced practitioner – is necessary for any newly qualified health professional starting employment. This e-learning programme is designed to develop the knowledge and skills needed to act as a preceptor to guide a newly qualified healthcare professional. The Preceptorship e-learning programme is designed to accommodate the needs of a busy healthcare professional. It has been created to help preceptors attain the level of training required for the National Preceptorship Standards. The programme uses case studies, videos and workbooks to help preceptors in their role, and to enable them to focus on coaching skills, resilience and reflection. If you already have an account with e-LfH, then you can enrol on to the Preceptorship programme by logging in to the e-LfH Hub, selecting My Account > Enrolment and selecting the programme. You can then access the programme immediately in the My e-Learning section. 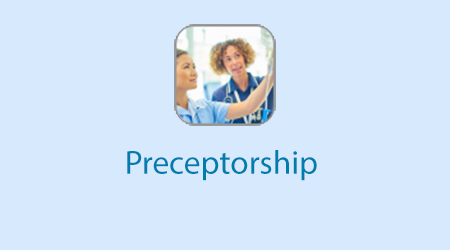 The Preceptorship programme is also available to NHS healthcare staff via the Electronic Staff Record (ESR). Accessing this e-Learning via ESR means that your completions will transfer with you throughout your NHS career.